North Denes post mill No. 1 was the second most northern mill on the Denes. The mill ran a single pair of five foot French burr stones and two flour mills. The mill was owned by Yarmouth Corporation and leased out to millers. THAT there is now erecting on Yarmouth Denes, a new POST WINDMILL situated about 300 Yards to the Northward of the Brick Tower_Mill that is commonly called the North_Mill, of which all Persons concerned are desired to take Notice. A Capital HORSE MILL situate in Mr. Boulter the Bakers row, with a pair of Stones for splitting Peas and Beans and making Oatmeal, a large Kiln, spacious Granary, a good Stable and other conveniences. Also a Tenement adjoining the Mill. The above premises were late in the occupation of Mr. Simon Woodcock Boyce and are very complete, desirably situated for business and in good repair and the purchaser may have possession of them at Midsummer next. It is not known if Simon Boyce was at the Denes mill at the time of the above two newspaper notices. The large and excellent POST WIND-MILL (the northward most but one) and the small dwelling house near, situate on Yarmouth Denes, with all the going geers and utensils. The mill has good pair of 5 feet stones and two excellent flour mills and is in good repair, full trade, stands well for the wind and is well calculated for the flour trade. Apply to Mr. Bell, Attorney. An excellent POST WINDMILL with the Round House, a Cottage and Outbuildings, situate on Yarmouth Denes, together with the Ground on which the same are erected, with one pair of five feet French Stones, also two Flour Mills and all the other going geers and appurtenances thereunto belonging, late in the occupation of Mr. R. H. DAWSON and of which immediate possession may be had. The premises are leasehold of the Corporation of Yarmouth for a terms of 45 years of which 34 are unexpired on the 29th September last and are subject to a yearly rent of £1. 1s. to the said Corporation. Apply to Mr. Spelman, Grocer, Yarmouth. A Capital Post Wind Mill with one pair of French stones, two flour mills and Round House capable of containing a large quantity of Corn together with a Cottage and granary, two-stalled Stable, Chaise house and other outbuildings, brick and tiled. The above premises are in excellent repair and may be viewed by applying to Mr. Thomas Hook, the proprietor, George Street, Yarmouth. A Capital POST WINDMILL with one pair of French stones, two flour mills and roundhouse capable of containing a large quantity of corn. Together with a Cottage, granary, two-stalled stable, chaise house and other outbuildings, brick and tile. 1st Quarter from Easter 1810, 3 months at 1s, 2d. in the £ per month. Made 3 July 1810. 1770: Mill built for William Harley who leased it - probably for 25 years to 1795-96 at a ground rent of 17s. 6d. 1796: Mill leased out for 45 years to 1841 at a ground rent of £1. 1s. 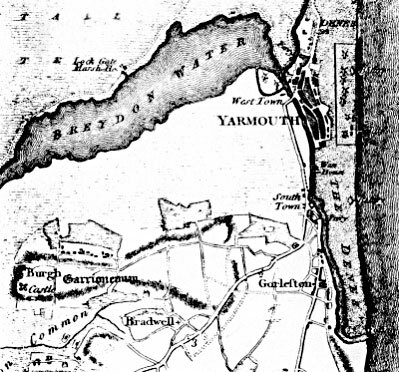 c.1875: Site owned by Yarmouth & North Norfolk Railway Co.